The Niagara IceDogs are right on schedule, as far as Billy Burke is concerned. 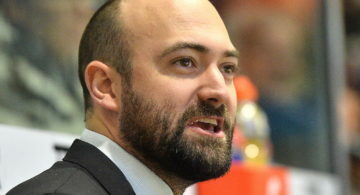 Less than 24 hours after a season-ending loss to the Hamilton Bulldogs in Game 5 of the Eastern Conference semifinal, the head coach of the IceDogs is already looking forward to next season with the utmost confidence. “Our goal next year is to win the league,” Burke said. “Our expectations are real high. We’re going set the bar real high. 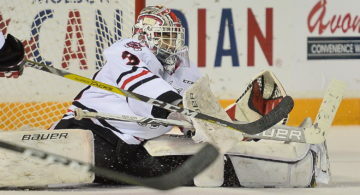 The IceDogs have good reason for optimism. Not only did the club show great progression, improving by 12 wins (23-35) and 24 points (56-80) from last season, but they also saw strong improvement from a number of players up and down the roster. 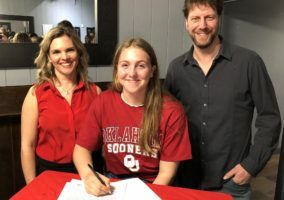 Up front, Ben Jones and Kirill Maksimov established themselves as legitimate OHL stars while Akil Thomas showed so well many are predicting he will be taken in the first round of the National Hockey League draft. On the back end, Liam Ham improved by leaps and bounds and Justin MacPherson also showed progression and could be a sleeper pick in the NHL draft. As well, promising youngsters such as Billy Constantinou and Philip Tomasino showed flashes of brilliance and should realistically be counted upon to be even more dynamic next season. 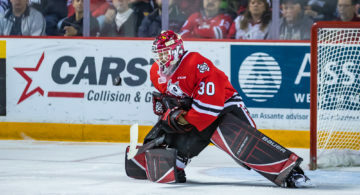 Toss in the fact goaltender Stephen Dhillon will likely return for his overage season, and many of the pieces are already in place for next season. But Burke also cautioned the IceDogs will be the hunted, as opposed to hunters, next season. Burke feels his team’s showing in the post season — they quickly disposed of the Oshawa Generals in the first round before succumbing to the Bulldogs —can do nothing but help them next year. “Absolutely, we’re happy. We put the fear of God into the top seed in the East,” Burke said. “It stings and we all truly believed in our hearts we would upset Hamilton. Burke said the IceDogs learned some valuable lessons in the playoffs. “You play three bad minutes, take your foot off the pedal for three minutes, and it can be the difference in a whole series. It’s getting a taste of that intensity and a feel for how magnified everything is. The IceDogs, who held their exit meetings and had a year-end lunch and team player awards Friday, graduated overagers Johnny Corneil, Sam Miletic and Adrian Carbonara.